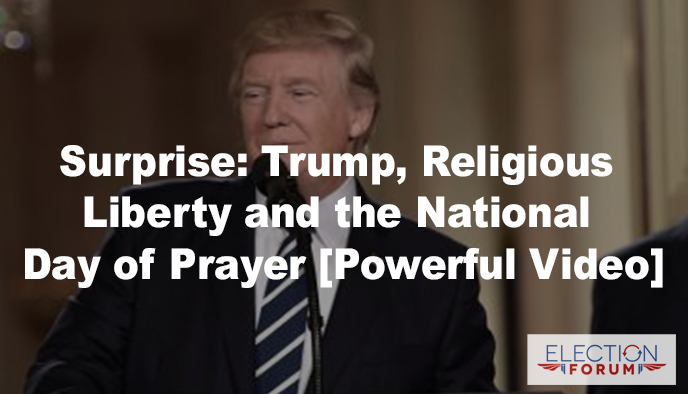 President Trump surprised the world today on the National Day of Prayer. With an executive order, he reaffirmed our religious heritage of protecting people of faith. The free exercise of faith is guaranteed by the First Amendment. But it’s been abused and attacked. Christian business owners have been forced into bankruptcy. Christian employees forced out of work in the private sector and government. Ministries forced to promote abortion. And so much more. Here is Trump’s video announcement – it’s powerful. Click here. Christians have been pleased with much of what Trump has done in the last 100 days. Is promoting hard the repeal of Obamacare to make healthcare more affordable and personal. Has promoted the most dynamic tax reduction bill in history that will create new jobs and raise the standard of living of America, lifting the poor and middle class to greater prosperity. You can see the full interview here. Click to watch. I love what Jerry Falwell Jr. said. I totally agree with everything. In 2014, we Republicans elected all these gungho young Republicans, who said they were going to do such-and-such, but DID NOTHING! That’s one of the main reasons Donald Trump was elected: we are SICK of politicians promising the moon, and then not keeping their word. President Trump is a man of his word, Thank God. These first 100 Days have been fabulous. It’s not just a breath of fresh air, it’s a Hurricane of Fresh Air blowing in Washington D.C. I give all credit to God and true Christians for their faith and their continuous prayers! According to James 1:5-8, I NEVER DOUBTED that God would have Donald Trump elected. I was not surprised at all the next morning when he was elected. I knew it ahead of time. We Christians have GOT TO QUIT DOUBTING! It kills prayer. I am DEFINITELY looking forward to the next FOUR years. Thank You Lord!! Donald Trump was not my first choice for this office, tho I did vote for him once the field narrowed. There are a few things he’s done that I disagree with, but overall, I give him a B rating. It would be a B+ if he were not so hampered by all the spineless RINOs failing to support him and were not under constant attack by the hypocritical crybaby leftists! He was not a man whom I viewed as particularly religious or “Christian,” but by his conduct, he has shown me that he is closer to God with a better relationship than a great many we all know who profess to be such good Christians and then do not act like it. thanks for all the latest news==you remain indispensable! Appreciate your wide coverage of the latest news, Craig! thanks for all of your hard work..